This update is going to be very short and to the point. Catherine Ryan Howard is an inspiration! Don’t believe me? Just check out her recent blog post. Books and Bites: Congratulations on the publication of your novel! Tell me a little about it – what’s your pitch? Leslie Ann Dennis: Hello, IWH! Thanks so much for taking time to interview me. It’s great to be here. 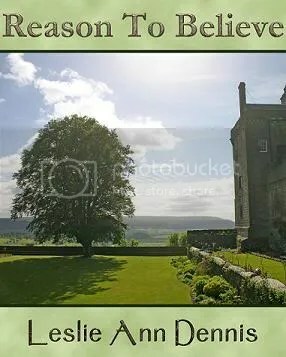 In my contemporary romance, REASON TO BELIEVE, my heroine, Lane Douglas is a die-hard realist, completely opposite of her superstitious grandfather who tells her he will die if a tree planted long ago in his honor in Scotland is chopped down. But when her grandfather’s health starts a downward slide, Lane hops on a plane and flies across the ocean to convince the landowner to spare the old, diseased oak. To her surprise the landowner is a devilishly handsome man named Conlan MacGregor. Practical Lane came prepared for a fight to save a silly tree, but she soon finds herself fighting to save her heart from falling under the magical charms of the hunky laird of Wolfscrag castle. LAD: When I was about twenty-five, I landed a big NY Agent who was a former editor of one of the BIG houses, and she got an editor at Silhouette interested in my story. Sadly, my agent worked at the pace of a snail and took off to the Catskills every chance she got (this was long before cell phones and she couldn’t be reached there). When I finally got word of changes I needed to make immediately in order to sell the story, I rushed through the changes and sent them back to my agent who, as an ex-editor, told me it was necessary for her to RE-edit everything. It took three months for her to send the revisions back to me, I worked on them day and night and sent them back within weeks only to have her wait three more months to send it on to the editor and guess what? The editor had already left the house. I wound up firing my agent, getting a “real” job and giving up on my dream for many years. I started back writing seriously in 2000. In 2003 I took a couple of First Place honors in various RWA-sponsored contests and had an editor asking to see the full story. Then, my brother passed away suddenly and my whole family was devastated. I finally crawled back to the keyboard and tried again in 2005, revising an older story and selling it to a small publisher in 2007. LAD: As a matter of fact, I do! After folks started purchasing, REASON TO BELIEVE, I began receiving inquiries from readers asking if I was going to give the hero’s sister and brother their own stories. Currently, I’m working on Bayard’s (the brother) story. BAB: How did you get the inspiration for characters? LAD: Interesting question. I wish I had a solid answer for you. The strangest things will inspire me, like how an actress looked in a fedora or the scene from a movie, or even a deodorant commercial. It’s strange because there’s no set thing or person that comes to mind when I’m creating my characters, it’s mainly just a hodge-podge of thoughts and ideas and memories that round out the whole. LAD: Conlan, the hero. He’s so likable. Male or female, he seems the type of person who’d be a kick to hang out with and listen to his stories. LAD: Unlike most writers I know, I didn’t always just “know” I wanted to write. I didn’t make up little stories about my Barbie and Ken or how Pooh escaped the 100 acre woods. I did, however, love creative writing class when everyone else grumbled all the way through it. I was a happy reader for most of my life, leaving the writing to others…until I started envisioning the story going in completely different directions than the author had written. I constantly thought “what if…?” and before long, I was trying my hand at penning my own novel. BAB: In writing your books, what was your most surprising discovery? LAD: I haven’t had BAD experiences at all. The only real drawbacks I found were the lack of publicity I received and how small the royalty payout was after sharing it between all the others involved. BAB: How was your experience publishing on the Kindle? LAD: It’s been excellent! I give a lot of thanks to the other indie authors who were so patient and kind to me when I was asking a billion questions about how to do this and that. I am very thankful too that Amazon is allowing us to publish this way for the Kindle. It’s an awesome step forward IMHO. LAD: Richard Matheson has been my favorite author for many, many years. I recently learned he’s also Stephen King’s favorite. I guess that means something, huh? 🙂 Runner up is Brenda Joyce. I love her romances. Available from Kindle (US) & Kindle (UK).